Want to know more about the different types of childcare institution that were developed? More information can be found here in this book. On a PC, try pressing and CTRL and f to get the find function. Type in your keyword (a word in the name or locality) in the find box that appears at the top of this page. PLEASE NOTE: The landscape of insututions in the nineteenth and early twentieth cetury was a very complex one and the organisations responsible for these institutions constantly changed (or their names changed). The details given here can be a guide only and cannot be taken as hard fact without further research. We tend to think of asylums as places where people with mental illness are sent. 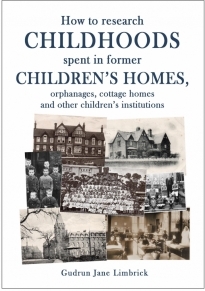 In the nineteenth century the term was used much more broadly suggesting a general residential institution such as a children's home or orphanage. Another name for tuberculosis or TB. The cottage homes were built by Poor Law Unions as children's homes to take children out of the workhouse. These were established in the 19th century as small local, often rural, hospitals which achieved funding through Poor Law legislation or local philanthropists to provide care for those who otherwise could not afford it. This was established in 1859 and set up its first two homes in that year - St Mary's for girls in Walthamstow and St Vincent's in Hammersmith for boys. In 1985, the Crusade of Rescue became the Catholic Children’s Society (Westminster) which is still functioning today. Farm schools were generally used for training children in farming skills - a working farm on which the children could do their learning while themselves working. They were generally a form of industrial school or reformatory (see below). Under the Liverpool Catholic Children's Protection Society (founded 1881), Father John Berry set up his first home in 1892 - St Phlips on Marble Street. He then took over a home in Shaw Street called St Vincent de Paul's House. Other homes on Shaw Street followed. Due to ill-health, he had to leave Liverpool in 1897 and the Society changed its name to Homes for Catholic Friendless Youths (Father Berry's Homes) and went on to open two homes in Canada for emigrated children - St. George's Home for Boys, Ottawa and St. Vincent's Home for Girls, Montreal. Fevers such as small pox and typhus were a massive problem in 19th century London, so much so that fever hispitals were estaboushed (through donations from benefactors to keep people with such infectious diseases all in one place - away from other hospitals and the workhouses where the infections may spread. Fever hospitals were also known as isolation hospitals. Some early children's homes were called hospitals. They were not hospitals as we think of them but were more like what we understand as orphanages. Directly translated from the French, this means hostel of God. They were established by the Catholic church as hospitals for the poor. An institution for 'fallen women', primarily women who were pregnant and not married. They were Anglican organisations set up in the latter part of nineteenth century. This group was established in 1897 in Switzerland "to meet the needs of young girls who, because of social changes, had to live away from their own families". It is know known as the International Catholic Society for Girls. This was set up in 1863 to fund and manager reform schools. The first reform school it took on was the Ship Reformatory for boys in an fomer warship, the Clarence. This ran until it burnt down in 1899. In 1940, the Association became the Liverpool Catholic Training Schools Association. Lyingin in hospitals were effectively the first dedicated maternity hospitals. The lying-in period was the period after childbirth when it was thought healthy for women to have a period of bed rest. Also known as Magdalene Laundries, these Catholic institutions generally took in women who were unmarried and pregnant. The fist Magdalene Laundries opened in London in 1758 (followed by similar institutions in Ireland). Many of these laundries were run as workouses with teriible conditions in them. The Board was set up by the Poor Laws in 1867 for the population of London who were both ill and poor. In 1930, its role was taken over by the London County Council. The Poor Law Act of 1834 provided that poor children, including those in the workhouses should be given a basic education. Further Acts formalised this and increased the amount of education all children should receive. It was this 1834 Act that meant that Poor Law Unions - geographical areas - should send money on providing free education for poor children. Some of these schools were known as Poor Law School. A receiving home was a short-term home, Children would stay for a matter of days or weeks while they were assessed and a permanent placement could be found. The idea of receiving homes continued until late into the twentieth century. Reformatories (also called reform schools) were where children were sent by the courts if found guilty of a crime. They were strict places where children would receive some training in a work-based skill. Unlike reformatories, children sent to industrial schools in the nineteenth century had not been found guilty of a crime but were thought likely to be criminals in the future (because of their circumstances or the company they kept) and so were sent to industrial schools for discipline and training. In later years, certainly by 1911, the difference between industrial and reform schools blurred with more children sent to industrial schools by the courts. More on industrial schools here. This was a term used to describe (generally large) residential institutions for orphans. Some orphanages adhered strictly to taking in only orphans, others also took in children who had lost only one parent or whose family were destitute. A Roman Catholic ecducation and religius education instituion estacbklished by Salesian Congregation of Saint John Bosco. They were intended for boys who were in need. This was generally used as another term for an industrial school ie. a school or home to which children were sent if it was thought that they may need extra discipline to dissuade them from getting into trouble in the future. A novel take on the industrial school was the industrial training ship. Children would be sent to the ships - there were several in 1901 - in the same way they would be sent to an industrial school. They would receive training appropriate for them to become a sailor. Truant schools were, in effect, a form of short-term industrial school. Whereas children were likely to be sent to industrial schools for a number of years, if not the remainder of their childhoods, children who were truanting could be sent for a lesser time to a truant school. In the early twentieth century, the term disappeared and the function merged with that of industrial schools. When Poor Law Unions were building separate residential accommodation for children, distinct from the workhouse, they were often called workhouse schools or Poor Law Schools. Generally, at the beginning of the twentieth century, these workhouse schools were either replaced or renamed as cottage homes or children's homes. The idea behind homes for working children is that they would be a stepping stone between a children's home or orphanage and independent living. Older children would go into the working children's home and be helped into a job from which they would pay the home a proportion of their earnings for their board and lodging The idea continued until the 1970s. Sanatoria, Catholic homes, poor law schools, asylums etc. On a PC, press CTRL and f to get the find function. Type your keyword in the find box that appears at the top of this page. Convent of Franciscan Missionaries of Mary, Bethell Avenue, London. At this convent young girls had work in embroidery, carpet-making, etc. Sisters of Charity (under protection of SVP – St Vincent de Paul), 40 Rothschild Road, London. Hand laundry and creche. St. Charles's School, Brentwood, London (poor law schoolpoor law school for boys) Opened 1884. It was run at different rimes by the Daughters of Charity of St Vincent de Paul and the Christian Brothers and the Crusade of Rescue and Homes for Destitute Children. Closed in 1954. Convent of Our Lady of Mercy, Handsworth. Hospital of St Dominic, for incurable female patients, Stone. House of Retreat for Working Girls. Retreat of the Sacred Heart (from Bruges). 24 Wheeley Road, Edgbaston. Sisters of Nazareth, Nazareth House. St. John's Home, Gravelly Hill. Conducted by Sisters of Charity of St Paul. Boys' Orphanage, Beacon Lane, Liverpool, under Sisters of Charity. House of Mercy for Servants out of place, Mount Vernon, Liverpool, under the Sisters of Mercy. Infectious Hospital, Litherland, Sefton. Served from St. Elizabeth's. Knolle Park Poor Law School (Church-road), under Sisters of St. Catherine. Magdalen Asylum, Rosemont, Edge Lane, Liverpool, under Poor Servants of the Mother of God. Nazareth House, Wavertree : for Destitute, Crippled, and Incurable Children and, when space permits, for Aged Poor of both sexes. Nursing and Convalescent Institution, Park House, Waterloo, Liverpool. Prescot Union (Whiston) Workhouse, served from Prescot. Rainhill Lunatic Asylum, served from Portico, Prescot. Warrington Union Industrial School, served from Woolston. Wigan Sanatorium and Small pox Hospital. House of Refuge for Penitents, Arno's Vale, Bristol. Industrial School for Girls, Salisbury (Sisters of Charity). Institute for young women (founded 1864), Stroud? St Joseph's Home, Cumberland - under the Little Sisters of the Poor. Asylum for Aged Poor, Sheffield. Mount St Mary’s Orphanage for girls, Richmond Hill, Leeds under the Sisters of Mary Immaculate. Founded in 1863 by the Leeds Diocesan Rescue Society. Closed in 1950s. Asylum for Aged Poor and destitute Children, Nazareth House, Leicester Road, Northampton (also certified as a Poor Law School). Orphanage for Boys, St. Francis' Home, Shefford. St. Francis' Home, Shefford, Beds (orphanage for boys). St. Mary's Convent, Albion Hill, Ipswich (orphanage for girls and certified poor law school). Poor law school for girls, 21 Gasking Street, Plymouth - for children from workhouses, under Sisters of Charity of St.
St. Mary's Industrial Preventive Home for Children, Eastleigh. Industrial School for Boys, Richmond Grove, Manchester. Orphanage of the Sacred Heart for Boys and Girls, Summerland, Jersey. Refuge for Penitents, Waterlooville and Bitterne. Barming Lunatic Asylum, Barming Heath, Maidstone, Kent. Founded in 1833 as the Kent Lunatic Asylum. later known as Oakwood Hospital. Closed in 1994. Belmont Lunatic Asylum. Founded in 1853 on Brighton Road, Sutton as an orphanage and poor law school for children Greenwich, Camberwell and Woolwich. It closed as an orphanage in 1902 and later became a psychiatric hsopital which closed in the 1980s. Bethlehem Hospital and Bedlam). Founded 1247 as an institution for poor people, developed into an institution for insane people and finally a psychiatric asylum. (Moved to West Wickham in 1930). Brookwood County Asylum, Woking, Surrey. Founded 1867. Camberwell House Asylum, Peckham Road. French Convalescent Home, Brighton - convalescent care for people in the French Hospital, London. Founded 1895. Home for Mental Maladies, St. George's Retreat, Burgess Hill, Sussex (for paying patients, ladies only). MAB School, ‘White Oak’, Swanley Junction (Metropolitan Asylum Home). Meath Convalescent Home for Epileptics, Godalming (Founded 1892 and named after the Countess of Meath). Metropolitan Asylum Home Fever Hospital, Stockwell. Refuge for Penitents, Manor House, Portslade. St. Anne's Home (St. Pancras Workhouse). St. Joseph's Orphanage for Boys, Orpington – under the Presentation Brothers. St. Philip's Orphanage for Girls, Uckfield - Sisters of Mercy. St. Vincent's Industrial School for Boys – under the Presentation Brothers. Served from St. Anselm's. St. Vincent's Industrial School, Whitstable - for little boys. Sisters of Mercy. Tooting Home for Aged Poor. St. Mary's Orphanage, Smyllum, Lanark.